At Bergamo this year, festival director Dave Douglas continued his very thoughtful programming, and as in 2016, his artistic success rate was very high. The festival has a split between performances in the historic upper town, and the lower town. The opening gig, on Thursday 23rd March, followed the traditional pattern – it was at the Teatro Sociale in the upper town, and featured Rudy Royston's OriOn Trio, with Jon Irabagon on tenor and soprano saxophone, Yasushi Nakamura on bass and Royston on drums. It was interesting to hear from the drummer that he was the son of a musical instrument repairer, and grew up surrounded by children's instruments, including percussion. His trio offered a very satisfying mix of grooves and free playing, with Irabagon – which, I learned from Dave Douglas's introduction, is pronounced Irabagon – on tenor and soprano saxes. The programme of original compositions was taken from the group's latest CD Rise Of Orion (Greenleaf) – the Bergamo gig was part of a European tour to promote the disc. The evening's second set was by Francesco Bearzatti's Tinissima Quartet, performing a tribute to Woody Guthrie. In some affecting performances, Bearzatti (tenor saxophone), Giovanni Falzone (trumpet), Danilo Gallo (bass, electronics) and Zeno De Rossi (drums) played compositions by Guthrie, or in his style. Subsequent main events were held at the Teatro Donizetti in the lower town – a larger, 900-seat version of the Teatro Sociale, also with boxes in operatic style. Here, the opening concert featured the Bill Frisell-Kenny Wollesen Duo, with guitarist and drummer presenting a long, 80-minute set. The pair made no announcements, but the first thirty minutes was a set of what seemed to be original compositions, each seguing into the next. 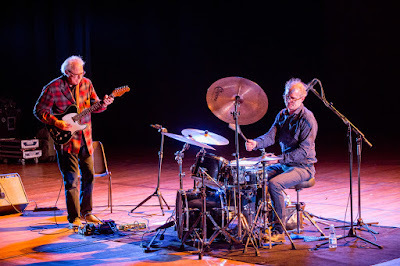 Frisell is the major jazz musician most clearly influenced by Country music – as well as rock – and even in the jazzier numbers that followed, there were more than hints of a Country feel. Lush Life is not something you'd immediately expect from Frisell; it was followed by a funky re-composition of Misterioso. Oleo was the jazziest number, in a straight swing groove, with Wollesen contributing a rare and intensely musical drum solo. Bob Dylan's Hard Rain Gonna Fall moved the approach away from jazz. Frisell sometimes plays loud, but never fast. I guess this performance could be described as chamber jazz, but the pair deployed a wide dynamic range, projected by a beautifully-balanced sound system – one of the great advantages of the Bergamo festival. The audience was respectful and enthusiastic, something that's also always apparent at Bergamo. Frisell was clearly relaxed and happy. Regina Carter's Simply Ella set featured the violinist with Marvin Sewell (guitar), Reggie Washington (bass), Alvester Garnett (drums). They began with the Country song Hickory Wind –"Ella liked to do lots of styles including Country & Western", the violinist commented, and more's the pity, I'd say. This piece was followed by the much more interesting Imagine My Frustration, a little-known, bluesy number that Ellington wrote for Fitzgerald. But these excellent musicians were prisoners of a lacklustre concept; the trio were often muted, or condemned to use sentimental effects such as kitsch slide guitar. There was an air of politeness, even Palm Court – a strange experience at Bergamo. In complete contrast, the early evening concert the following day, the Christian Wallumrǿd Ensemble at Auditorium Di Piazza Della Libertà, was one of this year's highlights. 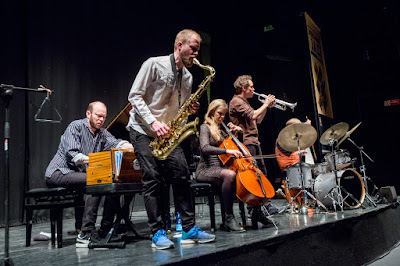 With Wallumrǿd on piano and harmonium were Eivind Lønning (trumpet), Espen Reinertsen (tenor saxophone), Katrine Schiøtt (cello) and Per Oddvar Johansen (drums, vibraphone). In a largely continuous and quite magical set, they explored the instrumental impulse essential to improvisation – though it was hard to decide how much was improvised, and jazz connections were implicit at most. By "instrumental impulse", I mean what Derek Bailey captured when he described the instrument as "not just a tool but an ally...a source of material...technique for the improviser is often an exploitation of the natural resources of the instrument". As other writers have commented, the ensemble possesses a rare ability to realise the leader's compositions, with their patient and close attention to timbre and dynamics. Later that evening, at Teatro Donizetti, we heard William Parker's excellent Organ Quartet, with the burly tenor-saxophone of James Brandon Lewis, Cooper Moore's wild explorations on keyboards, plus William Parker (bass) and Hamid Drake (drums and percussion) anchoring the rhythm. This was a loose, mostly groove-based and incredibly exciting performance; ecstatic jazz whose psychedelic intensity was mainly due to the presence of electric keyboard with an organ setting – not in this case really an Organ Quartet therefore. James Brandon Lewis was a name new to me, and his thick, curdled, dark-toned tenor reminded me of the excellent Mark Shim. The set comprised a continuous forty-five minute performance, and here Cooper Moore used an organ setting, and Parker contributed a long and exciting arco solo. On the second piece, the keyboardist changed to a piano setting. The encore was "Moment Without Notice", presumably a reference to the Coltrane classic. 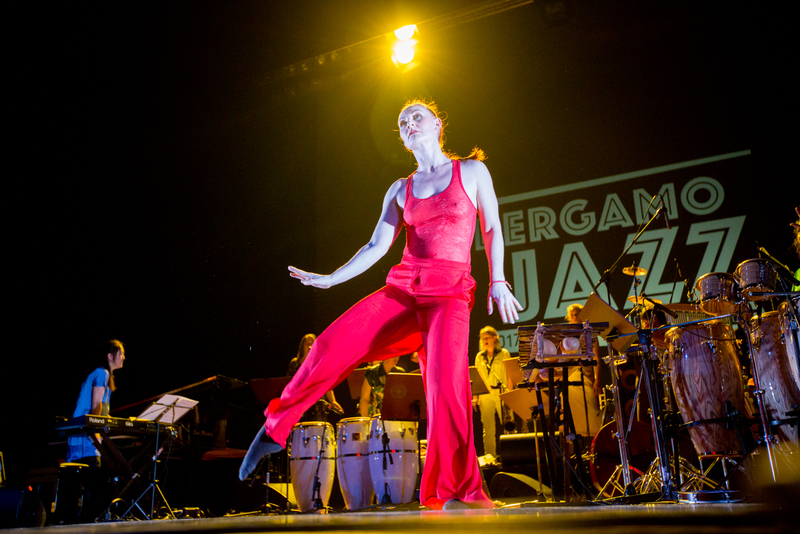 Parker's group were followed by Marilyn Mazur’s Shamania, an eleven-strong, all-female group of instrumentalists, with vocalist and dancer, in their first performance outside Scandinavia. Mazur apart, saxophonist Lotte Anker was the only name known to me; predominantly this was a polyrhythmic, polystylistic percussion ensemble. The vocalising and maybe the dancing were an acquired taste, but the percussion was exciting and involving. 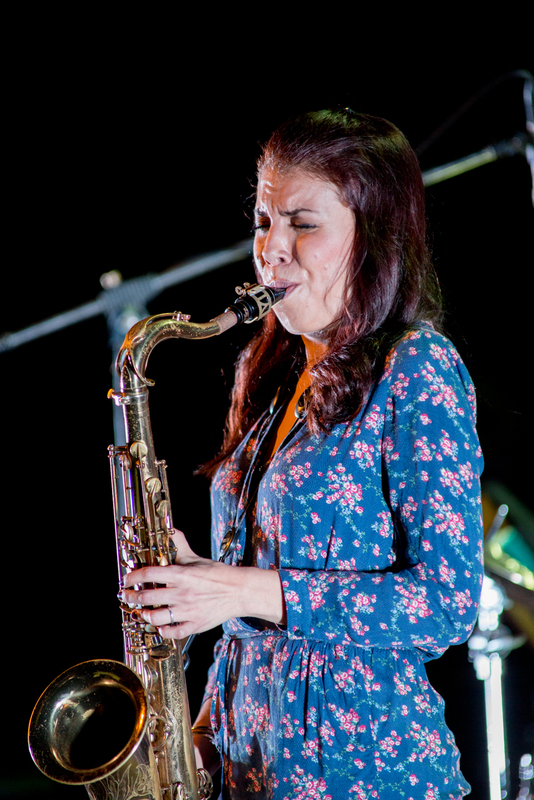 The final evening featured the Melissa Aldana Trio, with the leader on tenor saxophone, Pablo Menares on bass and Craig Weinrib on drums. This was a programme mostly of originals by leader and bassist, but also including the ballad Spring Can Really Hang You Up The Most. The young Chilean-born tenorist recently won the Thelonious Monk Prize, and on the evidence here of her very individual, intensely melodic and sonically original approach, the award was richly deserved. She created a distinctive soundworld, intensely-felt, without surface virtuosity or grandstanding. The last song of the set, an original, was dedicated to Sonny Rollins, who – she declared – was a main influence on her playing. It was good to hear that this influence was deep, but not obvious. The young musicians that made up the trio were totally simpatico. Enrico Pieranunzi & The Brussels Jazz Orchestra, featuring Bert Joris, performed the maestro's music, with Pieranunzi on piano and Bert Joris on trumpet as main soloists. Joris commented that "When I first heard Enrico's compositions, I immediately fell in love with them", while Pieranunzi himself was pleased to hear "another voice" for them. The compositions included Fellini's Waltz, With My Heart In A Song, and – I think – Don't Forget The Poet. The big band had a Birth of The Cool tinge, and it was good to hear these wonderful compositions in a new format, their structures articulated by orchestral arrangements – though the concert didn't change my view that their finest interpreter is Pieranunzi himself, unaccompanied. Other highlights included the Andy Sheppard Quartet with Eivind Aarset, Michel Benita and Seb Rochford; Evan Parker solo soprano and tenor saxophone at Biblioteca Angelo Mai; and cellist Ernst Reijseger solo. This was a festival put together with great care and artistic subtlety, and as always at Bergamo, the results paid off.